My experimentation continues at creating evocative and expressive images of people under extreme stress with this piece, the third of my Fukushima ghosts (see the previous two here) . My aims are to explore expressive mark-making in portrait painting, to make social comment on a current world event, and to create eloquent images about the human condition. For this painting i switched to a black absorbent paper that soaked up the oil paint and medium. I flooded the paper with both. The pigment moved about through gravity as i rotated the paper at strategic moments. I was allowing the paint its agency. I was relying on its agency. It was a partnership. We, the paint and i, are co-responsible for the way the work turned out. The first painting of my Fukushima series was fairly realistic, if somewhat stylized. Subsequent images have moved progressively deeper into what may be described as an abstract figurative style. Abstract figurative painting developed as American Abstract Expressionism was running out of steam in the 1950's. Many had declared the death of figurative painting some years earlier, and saw Abstract Figurative painting as a contradiction in terms. These theorists maintained that abstraction and figuration were at opposite ends of a continuum and so it made no sense to mix them. The movement referred to itself as Figurative Expressionism. So i guess that makes me a Neo-figurative Expressionist painter dabbling in Abstract Figurative portraiture. Not that i'm setting out to revive any art movement nor to prove some abstruse point in art theory. I'm just following the principle of a painter's right to paint any damn way he wants to. But all that abstraction and expressionism does the raise the question, "What ever happened to portraiture being the painting of a likeness to someone?". How can a puddle of paint be called a 'likeness'? It may, at a stretch, be called figurative, but surely not portraiture. I have touched on this issue in a previous post when considering the legitimacy of using photography as a basis for portrait painting. Let me just add now that notions of what might be a portrait have considerably expanded over the previous century. The Social Media Group observe that, "Traditionally, the ideal portrait both resembled the subject's physical appearance and captured the essence of that person. 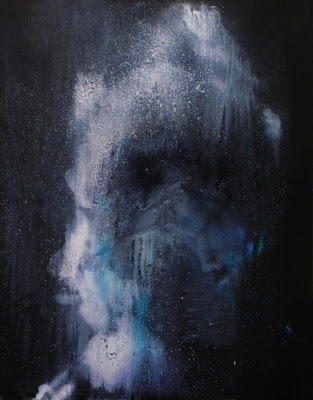 Contemporary portraits, however, are made within a cultural and artistic context with deep questions about the nature of identity, of representation, and of authenticity ... and technology is also changing the how we think about human identity: to portray the essence of a person, do we show the face? DNA? surveillance data? shopping transactions?" William Dobell's 1943 Archibald Prize win was controversial, as some people argued that his portrait of Joshua Smith so distorted Smith's features that it could not be called a portrait. The issue went to court, the case hinging on the accepted definition of portraiture: how faithfully did a portrait have to represent the sitter? Dobell's vindication expanded the concept of what could be a portrait, and abstract interpretations as well as conventional portraits were subsequently admitted to the Archibald. The Post-Sigmund Freud years have seen more interest in the personality, the neuroses even, of the subject, and less insistence on accurate draughtsmanship in the production of a photographic physical likeness. With the rise of Expressionism we have come to value discovering the personality of the artist in his or her work. We prize Egon Schiele's drawings for those very reasons. Francis Bacon painted a portrait of Lucian Freud not from a sitting by LF, not even from a photo of LF, but from a photo of Kafka as his inspiration (Kafa was LF's fav author at the time). Bacon's self-portraits contain some talisman of himself (a bag under an eye, or the sweep of hair across the forehead) but these iconic indicators hardly constitute a likeness in the conventional sense. Yet we accept that Bacon painted a portrait of Lucian Freud and numerous self-portraits. So a mere personification may be considered a portrait. Paintings containing symbolic objects alluding to the identity of the sitter may be considered portraits. A DNA printout, suitably framed and hung in the National Portrait Gallery, would be considered a portrait. Maybe Fukushima Ghosts III is not a portrait. It is not of any known individual. Even if it were, the face is contained within the mask of a Hazmat suit. And the painterly treatment of the suit is so fluid that it is hardly even recognizable as a protective item of clothing. Furthermore, the painting purports to be that of a ghost. And ghosts don't exist. So all-in-all, it can't be a portrait. It can't really even be called a figurative painting. Maybe a fantasy painting? Surreal? Yet i don't think so. I think it is a portrait. It is a generic portrait representing many anonymous individuals currently alive and working hard in Japan. Indeed, the anonymity of the workers has been one the key themes running through my Fukushima series, for it is a socially telling marker. Their anonymity is revealing! These generic portraits of anonymous workers are like the statues at the Tomb of the Unknown Soldier. The identity of the statue does not have to be known but the sense of humanity, of service and of suffering behind the work is palpable come Remembrance Day ceremonials. Actually, we don't recognize the persons in the vast majority of portraits we come across in our lives! And i'm talking Rembrandt and Singer Sargent. That leaves us unable to say anything about the quality of the likeness. Yet we prize the portraits of these artists. We prize them for the painterly skill in their execution and we prize them for the humanity they reveal about an unknown sitter, about an artist long dead, about a time and society otherwise obscured in history. Hi Harry, This one is the most powerful image of the three so far in my mind. The colors provide a window into that netherworld. Reminds me of some images from an old Twilight Zone episode from my childhood. I see it as a portrait and then some. This is, without doubt, one of the most eye-opening, educational and valuable posts I've been privileged to read. Your generous sharing of the course content and your own interpretation of it is a revelation. I've read it several times and now it's time to attempt to put these ideas into practice. And as you've seen, this won't be easy for me. Time to loosen up and "waste" some canvas. Just let go and spread some paint around without the shackles of "likeness". Of course, I've been trying to do just this ever since I discovered your art, but have failed miserably so far. The quest continues! Thanks for such a great read and another great example of your philosophy put into practice. Thanks John. Once again, this started life as a monoprint before i went crazy with spray-bottles of medium. Glad you can see it as a portrait. Whatever it is, it's what i do, lol. Glad you found it of interest, Gary. It's just stuff i cobbled together. My post-grad degree is by research, so there is no course content. That means i have to find my own way. This is just the slime-trail of where this slug has been browsing. Your portraits are fantastic as is, Gary. They are expressive, insightful and beautifully worked. By all means go wild as another string to your bow. Have fun. Explore. Be free. But it will come from an already sure foundation. As for physical likeness, i will no doubt be returning to that too. I'm far from decrying it. I'm just declaring our liberation to paint any way we feel like. Reading Kandinsky's "On the Spiritual In Art" has been a real incitement for me, haha. Harry, this is a wonderful thoughtful post that strikes to the heart of many issues I myself endlessly debate. What is truth in any artistic representation if there can be literal truth, as in a very close recognizable likeness, or abstract truth, as in a selection of symbols, allusions and associations that together make up something so familiar and powerful it is even closer? Why even try to catch these elusive birds in silken nets of terminology? For me, anything portrayed is a portrait. As for likeness, who's to say that someone might not one day view your Ghosts and say "Ah, I know this man." Powerful painting, powerful post, Harry. This is truly the ghosts in the machine. I am enjoying your exploration and your sharing of your thoughts. I love your distinction between literal truth and abstract truth Gabriella. I think it is issue in art forms - the tension between the descriptive and the metaphoric, between the detail and the form. My wife is a dramatist and i know she wrestles with this same issue with every play that goes into production. When all goes well for a painter, these two worlds come into mutual focus. When they don't, i think we end up with either vacant decorative pictures, or meaningless technical exercises in form, or works of abtruse symbolism, or didactic pieces of propaganda that have some polemic to peddle. It is a constant struggle to find an authentic voice that works both expressively and formally. And love you conclusion. By extension, if someone were to look into the painting and recognize something within themselves on the picture plane, then i guess it would a portrait - of the viewer, lol. Thanks Rhonda. I've much appreciated your interest and support. Though tht good news is that i'm almost at the end of this series, methinks. I'm becoming repetitive and i don't think a lot of regulars warm to the theme to begin with. If i churn out a few more just to practice the technique, i will probably not be posting them. Time to return to large format work. Interesting you say that, Hallie. I've been pondering some paintings that not portraits but large abstracts with titles like "Core melt-down", "Breached containment", "Dispersal Cloud". If i get a few together i will pop them into some future post. Thanks Dav, and i agree with your concern about distant future generations. Looking forward to your sketch on Fukushima.